May is Electrical Safety Month - Stay Safe! The Electrical Safety Foundation International (ESFI) is a non-profit organization dedicated exclusively to promoting electrical safety at home and in the workplace. As part of their featured resources this year, they remind you to Lockout/Tagout. According to OSHA, following proper Lockout / Tagout procedures prevents an estimated 120 fatalities and 50,000 injuries each year. 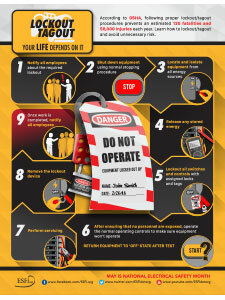 Learn how to Lockout / Tagout and avoid unnecessary risk.